Terry Butcher played in the heart of the England defence for ten years with his place secure from around 1982 onward. He was famously described by Graeme Souness as “six foot four of solid muscle”. Butcher began his career with Ipswich Town as a centre-back and soon impressed with his strength, commitment and courage. He was commanding in the air and an inspirational example to the defenders around him.England manager Ron Greenwood first put him in the side for friendly against Australia in 1980 and he played well, in the early days often with his Ipswich playing partner Russel Osman. At the 1982 World Cup in Spain, Butcher was the youngest member of the squad, and played in all matches bar one. Unfortunately England’s touch for goal deserted them in the second round and they were eliminated without conceding a goal. Greenwood left after the World Cup, making way for Bobby Robson, who, as a former Ipswich manager, had complete faith in Butcher. England failed to qualify for the European Championship of 1984 so the next major competition would be the 1986 World Cup in Mexico. Butcher was instrumental in a difficult second group match, after an unlucky loss to Portugal in the opener. Captain Bryan Robson came off injured just before half time, and then immediately afterwards, replacement captain Ray Wilkins was sent off for throwing the ball toward the referee. Butcher played like a colossus at the heart of a second half ten-man rearguard action with players reduced to snail’s pace in the 100 degree heat. They held on for a scoreless draw, knowing a second defeat would end their tournament. Finally England (and Gary Lineker and Peter Beardsley in particular) began to click and a superb 3-0 win against Poland ensured passage to the second round. There Uruguay were despatched just as ruthlessly, 3-0 again, and everyone looked forward to the confrontation with Argentina in the quarter-final, the first match since the Falklands War. The events of that are well documented, England going down to the two goals of Maradona, one farcical, one brilliant, and England were on their way home, despite coming close to levelling toward the end. Years later, Baddiel and Skinner made much of Butcher’s contribution on their television show, asking why he hadn’t hacked Maradona down as he skipped past on the way to his second goal! Back in the UK, Butcher joined Rangers under Graeme Souness and captained England for the first time in a 2-0 win against Yugoslavia, and soon after gained his fiftieth cap. The team stormed qualifying for the European Championship of 1988, winning five and drawing one of their six matches, and went into the final full of confidence. Unfortunately it was misplaced, in a personal tragedy for Butcher he broke his leg and missed the tournament, and England, missing Bryan Robson again, and with Lineker off form (later to be diagnosed with hepatitis B), lost all their group matches. 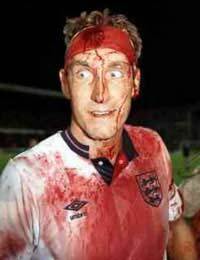 Qualifying for Italia 90, Bobby Robson’s final tournament as England manager, saw the most memorable images of Terry Butcher. During the vital match in Sweden Butcher suffered a deep cut in his head that was temporarily stitched up by the England physio. Heavily bandaged, he insisted on returning to the pitch and did not stop heading the ball, which re-opened the wound. As he came off at the end of the match, with the all-important draw secured, his face, bandages and shirt were red with blood. The World Cup of 1990 was the most successful since 1966 with Robson’s men getting it together after a dodgy start and going past Belgium and Cameroon on the way to semi-final defeat to eventual winners West Germany. Butcher was at the heart of a well-organised defence, often in a 3-5-2 with Mark Wright and Des Walker either side. As with many players in that side, Butcher then retired from international football. He also left Rangers to become player-manager of Coventry City, and a succession of managerial posts ensued, his most successful being with Motherwell from 2001 to 2006. As well as the image of the white-eyed monster staring from the bloody face, there is another that sticks in the memory, Butcher dancing with fans and other team members at the edge of the pitch after the last gasp second round victory against Belgium in 1990. Let’s all have a disco!